Enjoy the heat without harming the environment. cannot easily be contained and re-circulated. Our Electric heaters are specifically designed so heat doesn’t blow away in windy or drafty conditions. 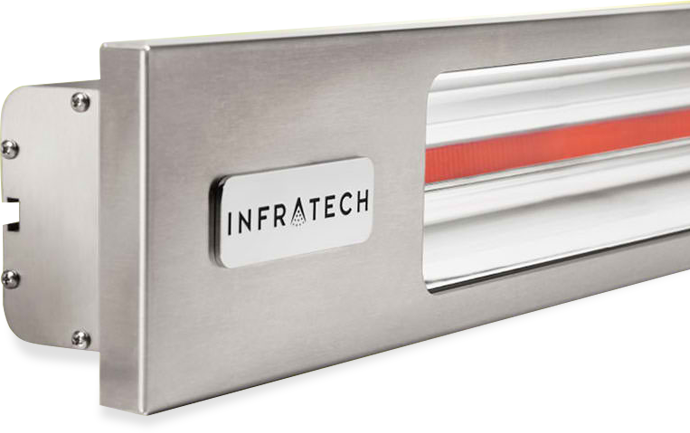 Our energy-efficient infrared fixtures convert over 90% of input energy directly into radiant heat, and operate for just pennies an hour. Our electric infrared heaters operate silently, emit no greenhouse gases or unpleasant odors and do not require ventilation. Our patio heaters incorporate a specially designed electric quartz heating element (rated for 5000 hours) resulting in the production of safe infrared radiant energy. Radiant energy is only absorbed by solid objects and is not wasted heating the air. 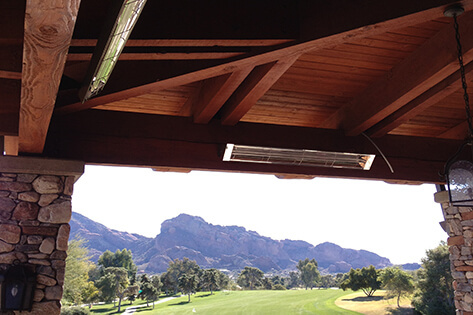 For this reason, infrared heat can be distributed very evenly, and will not simply “blow away” in windy or drafty conditions. Our heaters emit a pleasing glow that will not affect the ambience of your gathering - unlike competitive short-wavelength or halogen electric heaters that produce a very harsh glare or bright-colored light. We can install at lower mounting heights, under canvas, wood awnings, eaves and interior locations. Adjustable swivel mounts allow for ceiling or wall installation. Solid state or analog controls are available for intensity adjustment including multiple zones, timers and home system integration. Copyright © 2019 Señor Mist. All Rights Reserved.